Donut Blocks (also known as Donut Lifts, Falling Blocks or donut platforms) are a kind of platform first appearing in Super Mario Bros. 3. They get their name from the fact that they are round (except for the top) with a hole in the middle. If the player stands on one for more than a second, it drops below. For this reason, Mario and Luigi should avoid touching the ground by jumping as much as possible when crossing Donut Blocks. Donut Blocks debut in Super Mario Bros. 3. They shake when Mario stands on them and fall soon afterwards. In Super Mario Advance 4: Super Mario Bros. 3, there are spiky variants only seen in Bowser's Last Stand. Donut Blocks appear in Super Mario 64 and its remake, Super Mario 64 DS. These platforms resemble their two-dimensional counterparts, but are shown to be rather long (whereas Super Mario RPG previously showed confirmed "three-dimensional" Donut Blocks to be more square-shaped than rectangular). In Rainbow Ride, most had to be jumped over during the magic carpet ride and some served as bridges to other parts of the level. Donut Blocks reappear in New Super Mario Bros. In this game, they turn red before falling. Once they fall, they never regenerate. Donut Blocks reappear in New Super Mario Bros. Wii, where they function the same as in New Super Mario Bros.. There are also yellow bars with grooves on their ends. When Mario walks over or hangs on them, they behave the same as Donut Blocks, turning red for a second before falling down. This variety appears only in World 4-2. Donut Blocks reappear in Super Mario 3D Land. However, in this game, when being stomped on, they immediately fall down slowly and disappear below the stage. A rock variation exists, and it has the same effect. The Donut Blocks make an appearance in New Super Mario Bros. 2. Glacial versions of the Donut Blocks also appear in the snow world (World 4). These Donut Blocks are slippery and can be differentiated from the ordinary Donut Blocks by their light blue color. Other than being light blue and slippery, they share every characteristic of the normal Donut Blocks. Donut Blocks also appear in New Super Mario Bros. U with the same functions as in the other games. Donut Blocks appear in Super Mario 3D World and Captain Toad: Treasure Tracker with the same design and behavior from Super Mario 3D Land. They now turn red when stepped on. 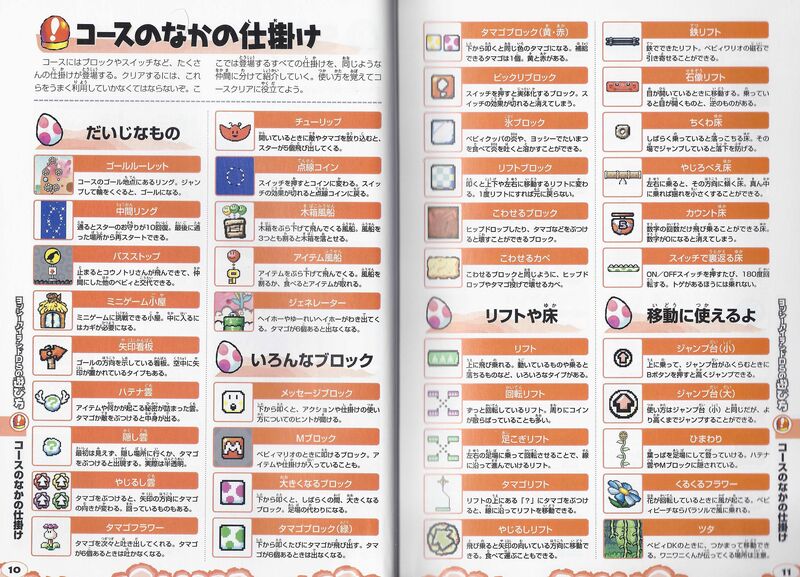 Donut Blocks reappear in Super Mario Maker, Super Mario Maker for Nintendo 3DS and Super Mario Maker 2, with the same functions as in the other games. Super Mario World 2: Yoshi's Island and its remake Yoshi's Island: Super Mario Advance 3, as well as the sequels Yoshi's Island DS and Yoshi's New Island, also contained Donut Blocks. In Yoshi's New Island, a variation that is four times the normal size appears. In Yoshi's Woolly World and Poochy & Yoshi's Woolly World, Donut Blocks reappear, retaining their function from Yoshi's Island. In this game, they appear to be made of sand, and disintegrate and fall when stepped on. Unlike previous installments, they do not turn red when falling. Super Mario RPG: Legend of the Seven Stars additionally features them, accurately adapting their platforming concept into its isometric field gameplay. Donut Blocks appear in Super Smash Bros. Melee, in the stage Rainbow Cruise. Donut Blocks reappear in Super Smash Bros. Brawl, in the returning Rainbow Cruise stage. Also, Drop Blocks, blocks with a down-pointing triangle on them, act just like Donut Blocks. These blocks are only used in the Stage Builder and certain stages of The Subspace Emissary. 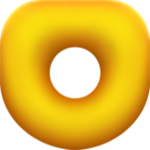 Donut Blocks also appear in the 3D Land stage in Super Smash Bros. for Nintendo 3DS and Super Smash Bros. Ultimate. They also might appear in the downloadable Super Mario Maker stage. In Mario & Luigi: Dream Team, Donut Blocks appear in area B of Dreamy Neo Bowser Castle. They retain their colors from the New Super Mario Bros. games, but are much thinner, more stretched and rounder this time around. They function similarly to Super Mario 3D Land, where, once they are stepped on, they turn red and fall after a short time. Donut Blocks reappear in Mario vs. Donkey Kong 2: March of the Minis, where they function the same as in previous games. 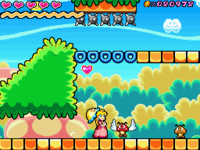 Donut Blocks reappear in Super Princess Peach, where they also have blue variants. If Peach stands on these blue Donut Blocks, they will fall immediately, so Peach needs to use her Gloom Vibe to quickly move across them. A Donut Block from New Super Mario Bros.
Chikuwa Burokku Chikuwa refers to a type of Japanese fish cake shaped like a tube. Rifuto and Burokku are transliterations of the English words "lift" and "block", respectively, and 「床」 yuka means "floor". ↑ Super Mario RPG: Legend of the Seven Stars instruction booklet, page 17. ↑ New Super Mario Bros. U Prima eGuide, Items and Objects Tab. ↑ Super Mario 64 Player's Guide, pages 120 and 122. ↑ Stratton, Steve (November 18, 2012). New Super Mario Bros. U: Prima Official Game Guide, page 127. ↑ Super Mario RPG instruction booklet, page 17. ↑ The Mushroom Kingdom. "Super Mario World 2: Yoshi's Island: From Japanese to English". Retrieved May 30, 2008. This page was last edited on March 7, 2019, at 10:34.